Each emotional reaction, thought, opinion or tendency, even the smallest personality trait, is a luminous ray which is invisible to you, but belongs very personally to each individual being. In the same way, the fixed and yet eternally moving spiritual laws, which pertain to every possibility or modality of outer or inner reaction, also create such luminous threads. Wherever your personal rays agree with those of the spiritual laws, you fulfill your life and you are in harmony and bliss. Wherever personal rays deviate from spiritual laws, you find yourself in disharmony. This causes the difficulties which you so often, and so erroneously, believe to be blows dealt to you by fate. The more you remove yourself from the roots of the difficulties by covering them up and pushing them into the unconscious, the more difficult it will be to perceive the connections and to dissolve, or pull out, the flawed roots. If you wish to be happy, you have to go to the flawed roots within yourself. This “radical” approach, this going to the roots is the path of perfection or purification, or the healing of the soul—whatever you may call it. You who seek contact with God’s world for this purpose—and without this contact purification is not possible—will receive the greatest support and guidance and everything will develop in the best way for you. You will indeed be in good hands. To follow this path, you also need outside help and advice so that you can remove the first stones which block your way to contacting God’s world. The purpose of outside help is to make inner help possible, or, to put it another way, help must first come through outer sense perception to bring about autonomy of the inner perception or intuition. Outside help can be given by a human being who has already reached a higher level on this path, or through one of God’s spirits. But outside help is not enough—and it must not be thought to be enough; it is only an impetus, only the seed which has to ripen into fruit through your own work. You must achieve a breakthrough to your inner self. You know very well that it is not possible to accept something, no matter how illuminating, because somebody says it is so; it is especially not possible when there are personal, inner, unconscious resistances to it. All the truths of Creation, all the spiritual laws—everything that humans are at all capable of comprehending—have to be experienced personally to become genuine inner knowledge and so be applied in a personal, productive way. Only by following such a path as this is inner knowledge and the personal use of it possible. Insight into any truth can occur only when you have established personal contact with the world of God, at least to a degree, and such contact can only come when you have achieved a breakthrough in your soul to the higher self. 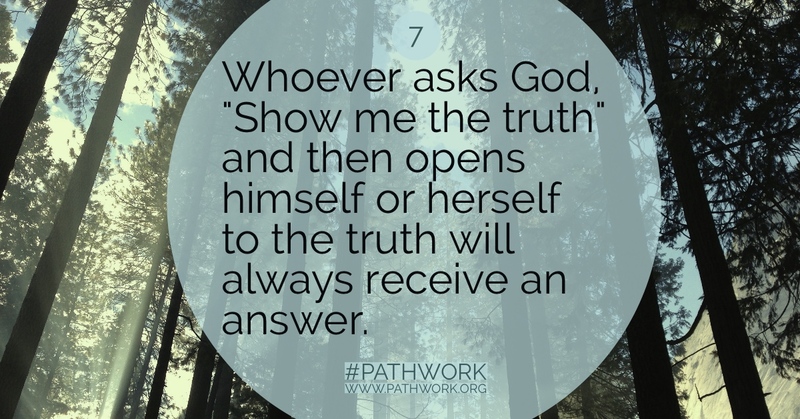 Whoever asks God, “Show me the truth” and then opens himself or herself to the truth will always receive an answer. But you so often do not dare to take this step. You cover up what is most important, push it aside, and busy yourself with worries and petty concerns. You forget what is most essential. Yet the worries are trifles, superficialities, viewed from the perspective of total truth. Summon up your inner will for truth and open yourself to it! Ask God for the recognition of His truth. If you sincerely wish to perfect yourself—and therefore first to know yourself—then, as you go on, you will receive the necessary spiritual help. It will come to you in an ever expanding way. It will alternate between outside guidance and recognitions and insights which will also serve as answers and signposts. The connection with God’s spirit world is usually referred to as mediumship. Not everybody has to become a trance medium like this medium through whom I speak. Yet everybody can make contact in some form with the spirit world. Be open to this. Do not say, I want it in such and such a way; just be open and free to letting yourself be guided. Then guidance will come at the time and in the manner best for you. Much will change in the life of the person who follows this path, who commits himself or herself entirely to God, not only in word, but also in action. Each change will come slowly and naturally, as if by itself. That is what is so wonderful. Nothing will happen that is harmful or creates disharmony. But you have to do your part by staying open and extending your inner antennae, so to speak. The capacity for staying open will also be strengthened. Now I want to give you some general instructions. There are people who believe that something is right because its opposite is wrong. And yet both extremes are wrong, precisely because they are extremes. Here is an example: The higher a person’s development, the more important it becomes that he surround himself with kindred human spirits so they can mutually help and stimulate each other and make the contact productive. These contacts will not harm the soul, as do some contacts, no matter how innocent they may appear. Yet here, too, nothing should be forced. Ask for guidance, will this guidance, and it will come in a much wiser and more wonderful way than you can imagine. Only those who have experienced guidance can know the wonder of it in the depths of their soul. On the other hand, people who have already achieved a higher level of development and possess sufficient strength will, because they are aware of unpleasant or harmful experiences with people on a lower level, withdraw from contact with them when they should rather not. A person trained in contact with God’s spirit world will know which relationships to keep and which to give up. The stronger you are, the better grounded in your path, the smaller the danger that you can be harmed by lesser developed beings, and the greater your opportunity to help and influence them. However, people’s first reaction is to do that which is easiest: those who can still be harmed spiritually through contacts with less developed souls are usually still at a stage where these contacts will not be unpleasant to them, and so they do not wish to give them up. They persuade themselves that they can help with what they have already gained, yet they are not truly capable of giving such help and will, instead, be weakened. Rather, they ought to seek out contacts which will strengthen them. On the other hand, people who can no longer be harmed, for whom these disharmonious contacts are but tests through which they can strengthen themselves, are in a state in which these contacts feel like sacrifice; they want contact only with kindred spirits and avoid those who do not give them pleasure. They are inclined to apply what was true for them before, but should no longer apply in the same way, namely, that contact with people of a lower development is harmful. Here one can sometimes make a mistake by not fulfilling a task with a weaker fellow human being, when one could do it. If the soul of someone who has already progressed quite far on this path is still unhappy, if there is something that makes it restless despite its already accomplished spiritual work, the cause could be the avoidance of an unpleasant contact with somebody one was meant to help, the avoidance of a soul with whom one could have fulfilled a task and learned from it. You see, the rule is not always the same. Think about this when you are not entirely happy; avoiding a task with a person of lower development may be the cause of your unhappiness. The soul of a highly developed person is very sensitive; a lack of harmony is its way of telling that something is not quite right. However, do not jump to the conclusion that you are necessarily in the position of a higher developed person, just because that idea suits you and you don’t want to give up control. The issue is—and you can best affirm it yourself—that quite often that which you experience as most difficult or unpleasant is perhaps precisely where something gets bogged down, where something is not properly handled. Thus it takes away from the happiness which could be yours if you gave yourself totally to your path and fulfilled your life. You might think about this topic further. Everyone can learn from it, but none of you should force themselves to act in one way or another. Be ready to be guided to the right action, ask for the help, be open. That is all you need to do. If, however, you are not ready to follow guidance, either in this area or in any other, you cannot be helped. People could be helped so very much if only they would open themselves again and again to receiving help. Yet they simply forget to ask for it; and so often they do not even want to think about it. How much happiness, how much bliss they lose this way! The wonderful forces and luminous rays of the spiritual world are ready to embrace you, but you often make it impossible because your own rays move in a different direction. They cannot harmonize with the luminous threads of the greater reality, and so beneficial influence and help cannot reach you. And now, my beloved friends, I am ready to answer your questions. QUESTION: I just read a book by Prentice Mulford which almost completely agrees with your teachings, but there is one thing which I do not completely understand. He says that one should not preoccupy oneself with the negative, especially not with one’s own faults; such preoccupation creates more negativity. It is enough to identify the negativity and leave it at that. You, however, taught us not only to confront our faults, but also to fight them. Yet in order to fight them we have to think about them every day. Here I find a contradiction between your teachings and the book. ANSWER: There is no contradiction. It is a question of how to confront faults. Many people like to wallow in their faults, immerse themselves in a false guilt which I have already mentioned several times. These people lament, saying, “I am a sinner. I am so bad. I cannot overcome my sins. How terrible that I have this fault!” And whenever they encounter it, they throw themselves into the same unproductive current, thus increasing their guilt feelings. These guilt feelings have further consequences and a chain reaction is set in motion. This kind of preoccupation with one’s faults is obviously wrong. It not only attracts negative forces, it is also based on self-deception. Such people believe themselves to be very humble, while in reality they only want to take the easy way out by telling themselves that everything is hopeless. This attitude is frequent and it is just as much at a false extreme as its opposite: wanting to see oneself as already perfect. A person with spiritual understanding who tries to dissuade you from preoccupation with negativity means this kind of preoccupation. On the other hand, it is absolutely necessary on this spiritual path that you learn to know yourself as you are and to accept your temporary reality. This does not mean that you should put your hands in your lap and not do anything, but that you say to yourself, “This is how I am. I have this fault. I know it takes struggle, willpower and patience to eradicate it, but I can and will do so.” This is productive. For when you look closer, you will realize that the terrible upset, the exaggerated guilt feelings about faults and shortcomings, are nothing but a form of pride and arrogance. You want to be better than you actually are. You want to be perfect without taking the trouble to become perfect. When you have to recognize that you are still imperfect, you feel devastated because your vanity is wounded. Not to accept yourself as you still are is unhealthy. Whoever feels the truth of these words should think and meditate about them and new doors will be opened. As I have said so often, it is the how that matters. Once you have come far enough to see yourself with all your faults, devoid of defensiveness and feelings of disharmony, as an uninvolved observer would, you can build the positive—and only then. For you must build on a foundation of truth. You cannot build on lies or untruth, and those who do not know themselves and their motives, either by not wanting to or through self-deception, build on untruth. When you accept calmly who you are just now, you possess true humility which will set in motion the forces of transformation from deep within. Then you are able to see the reverse, that is the original goodness at the root of your faults. By visualizing the positive you create a new thought form and direct your will toward it. As I speak to you, my dear friends, about the perfection that you should strive for, you may imagine it vaguely as something to be got from the outside, something you do not have in yourselves. This, of course, is not so. The perfection lies dormant within you deep down beneath the layers of the crust, hidden by your lower self, but it is only covered up—the perfection is already in you. You need only to remove the crust, and that is done by first recognizing it, by accepting the thought that there is a crust that takes such and such a form. Only when this is done can the layers of the crust be thinned out and so allow the breakthrough to the higher self in those places where your faults have so far made it impossible to establish contact with your inner perfection. When you clearly understand that perfection is already in you, it will be easier to overcome the difficulties and free yourself of the fetters of the imperfections which alone rob you of your freedom. Then you have to unfold your latent inner perfection. When you have clearly crystallized your lower self into definite form and see it as a foreign body within the self, you can begin to build the positive form toward which you move in the process of self-realization. Let us take an example. A person is fighting his selfishness. This fault is in almost everybody. Some have it to a greater, others to a lesser degree, one in this form, the other in another, but everyone has at least some selfishness in him or her. As at the end of every day the person examines his reactions, he will reach, step by step, the following stages: First, he will find it very hard to recognize where he has been selfish; next, as he asks more and more to see the truth and as he opens himself to it, he will recognize certain events which he used to bypass but which he now sees as examples of his selfish behavior. Such recognitions will make him very uncomfortable at first, they will upset him and give him a bad conscience. These feelings in turn will create a resistance against the recognitions. In this phase the battle is to overcome the resistance and to nevertheless accept the self as it is in the moment. Persevering in this fight will eventually bring an immeasurable spiritual strength and with it further spiritual consequences in the best possible way. To progress in this phase the person has to attack the resistance from several sides. He needs to pray for strength and willpower to see himself as he really is. He needs to meditate to arrive at a deep inner recognition of his lack of humility, of his pride and arrogance in being so terribly upset about his fault. He needs to meditate to see how very far from the truth he is when he cannot accept himself as he is. He also has to go deeper into himself and find what other characteristics his pride and arrogance have given rise to. Thus he will acquire a better understanding about his personality and unconscious emotional currents. After a certain time these efforts of daily self-finding, retrospection, meditation, prayer, and resolutions will enable the person to react in a new way. He will succeed in applying what he knows in his daily silent hour and will react from this knowledge to whatever happens. As he once more goes into his stillness, he will recognize the progress he has made in handling his problem. Yet he will also have to notice that his feelings were still opposed to his controlled reactions, and thus there was an inner split behind his action. It is easier to control actions than feelings, and the danger is that you may cover up the emotional reaction, pretending it is not there, until the feeling sinks into the unconscious. It is precisely this split and repression which give rise to the unhealthy soul currents. You may act right because your conscience says that you must follow what you have learnt about right and wrong, or because you believe this buys recognition and love from your surroundings. Yet when the action is not supported by a corresponding feeling, it becomes a lie. If you courageously fight on for your inner truth, you will be able to avoid the lie and identify the false emotional currents underlying your correct outward actions. You will know that more spiritual work is needed to change the feelings, and you will not shy away from such work. You will then, in your meditations, build good, healthy spiritual forms—for instance by visualizing yourself free from selfishness, or whatever other fault you may still have, and by feeling how much joy you can experience by letting others also have that which you hitherto had wished only for yourself. In time, this form will become so powerful that it will stand out just as clearly as the part which is still a residue of the lower self. You will always be aware of the discrepancy—but now without being upset by it. Slowly, slowly, old, false currents will transform themselves and be in line with outward actions and what you recognize as being right. This is the process. Of course, it is more convenient not to do all this. It is an inconvenience to face oneself over and over again in this kind of self-honesty. And people are very resourceful in finding excuses to justify why they do not need to or cannot do it. They are inclined to cling to what is easiest. But what is easily gained is not worth much. Only what comes to us through inner discipline and overcoming of what is difficult, only that for which we have paid the price, brings lasting happiness. It cannot be otherwise. QUESTION: How can one dissolve one’s fear when one is not in personal healing at the present time? How can one dissolve a deeply embedded fear and insecurity? ANSWER: You can do it only on this spiritual path. You cannot do it alone. You can accomplish it only through the two kinds of help, the outer and the inner help. Once you have made the decision to walk this path and commit yourself totally to God, not only in words and as a generally held belief, but through your entire inner attitude and by accepting the consequences, both inner and outer, that follow from the decision, you will be guided to the outer help which will open inner doors so that the inner help that is personal contact with God’s spirit world can be established. With this help you can remove any emotional distortion. Some of my friends have already experienced the truth of these words in their lives. All who make such a decision will be given everything they need. Those who make the decision to seek the contact and walk the path of perfection will also want to free themselves from all imperfection. And when fear exists, it is the symptom of an imperfection, of a violation of spiritual law. Such fear can be a large, entangled skein, which actually exists as a spiritual form. On this path it can be disentangled, knot by knot, until the whole entanglement is sorted out and you can live without fear. Of course, fear has a different source with each individual, and therefore I cannot give general rules as to what is at its root, nor tell you exactly how to dissolve it. The topic of tonight’s lecture may apply here also. Those who always look for a back door, who always take precautions and do not commit themselves to anything completely, be it God and the important spiritual issues or a minor mundane one, will find themselves caught up in an emotional current in which their fear will increase. As a result of their choices, they have no firm ground under their feet. They do not belong anywhere, they have nothing to hold on to in the erroneous, though often unconscious, belief that they do not risk anything when they do not commit themselves to anything. This attitude can cause increasing fears. Another frequent factor in fear is lack of faith. The conditions for the grace of living faith were not fulfilled; therefore such people will have to rely on themselves entirely. They believe that everything depends on them; yet, paradoxically, they will neglect doing what truly depends on them and so will not effect changes where they could. At the same time, they will feel that they depend in many respects entirely on God, yet they cannot experience the feeling clearly, and they waver in their loneliness, because they do not fulfill the lawful conditions whereby they could put themselves into the hands of God. Even when such people have some intellectual knowledge of the great truths, this kind of knowledge will be vague, unreal, doubtful, and will not support them. The more such thoughts take possession of them, and the more they nourish them through their intellectual channels only, the more they remove themselves from any positive divine influence—and the greater their anxiety will grow. In their ignorance, they will violate more spiritual laws and thus remove themselves even more from the possibility of a direct experience of the greater reality. Furthermore, the fear may also come from clinging tightly to the ego with its self-pity, vanity, cowardice and pride—in short, everything that nurtures the ego, which wants to feel special. This also is mostly unconscious, yet the more unconscious the process is, the farther away one is from putting an end to it. This is why it is so important to make everything unconscious conscious and examine it in the light of truth. The elevated ego makes you lonely, it puts you indeed into a special place, though in a different sense than you had imagined. It separates you from your surroundings and makes you blind to truth, because vision cannot come when a law is violated, and here the Law of Brotherhood is violated. The people who surround themselves with a wall of separation will become lonely and detach themselves more and more from the people around them—and this has nothing to do with their social life, which might be very active. The separation then will increase the fear. These are the main points about fear, and they can be linked to other personal, inner currents. As I said before, all this can only be recognized and overcome on the path of self-recognition and purification. Whoever commits himself to the path will obtain all imaginable help. QUESTION: At certain times I have a series of insightful dreams, and then come longer periods without dreams, even though I prayed for them before going to sleep. Does this have to do with lack of physical strength? When I am tired or overworked I don’t have dreams. Is this perhaps similar to the connection with the spirit world for which we also need a certain kind of energy, the so-called odic force? ANSWER: Yes, the odic force has something to do with it, as the mutual influence of the spiritual and the physical is very strong. Yet this is not the only factor involved. Dreams cannot be requested. It is all right to ask for signs and answers, but the forms these take cannot be determined by you. Perhaps it is better for you, in a certain period of your development, to obtain answers in a different form. You are not yet able to judge why help should come to you in a different way from the one you asked for. But perhaps your dreams of insight have become too habitual and therefore they do not require much spiritual labor for you to interpret them. The intention may be for you to exert a greater spiritual effort and, if you do, you will receive the answer in another form. The accustomed way might still be used when it is very important for you to recognize something. By and large, however, the guidance will come in a way that will require from you greater spiritual effort to understand it; the purpose may be for you to establish a connection in yet another way. QUESTION: If a person who has become convinced of the possibility of spiritual healing, even though he has not yet reached that stage in practice, turns to a doctor for help, does he show a lack of faith? Should he fight the illness without using medical help? ANSWER: No. Doctors are also God’s instruments. Where a doctor can help, one should go to a doctor. Where he cannot help, one can search for healing in the spiritual way. It is not advisable to focus too intensely on one thing; that is to want something in the wrong way. Again, it is easy to misunderstand this. To want the overall goal with a healthy will is very important, but to exercise a cramped, overintense will on a specific detail could be a great obstacle. Illness has different causes. They may be karmic, or they may be the symptom of a distortion in the soul that can be traced to the present life. Such a symptom cannot be removed while its root remains in the ground. When the root is pulled out, the symptom will disappear. Therefore the problem of sickness must be examined from this point of view. It is not enough to remove the outer symptoms, the sick root must be found in the soul. That is the solution. My dear friends, I now withdraw into my world, and I tell every one of you to persevere on this path. As you do so, your life will become better and better. No one is alone; all of you are blessed by God and His world.